Hot water is a necessity when you are brewing tea or coffee. Here you will find both electric kettles and water kettles that are heated on the stove, choose your favourite! 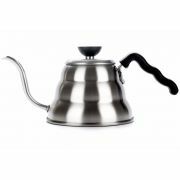 We have models from Hario, Brewista, Fellow, Alessi and other high quality brands. When brewing pour over coffee, it is important to have total control of the pouring. 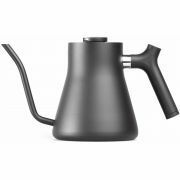 Therefore all of the kettles have a small thin pipe that gives precision over the pouring. Having a correct temperature is also very important. Many of the electric kettles have temperature control system with 1 degree precision. Kettles also come with integrated thermometers, or you can fit them with a separate thermometer.